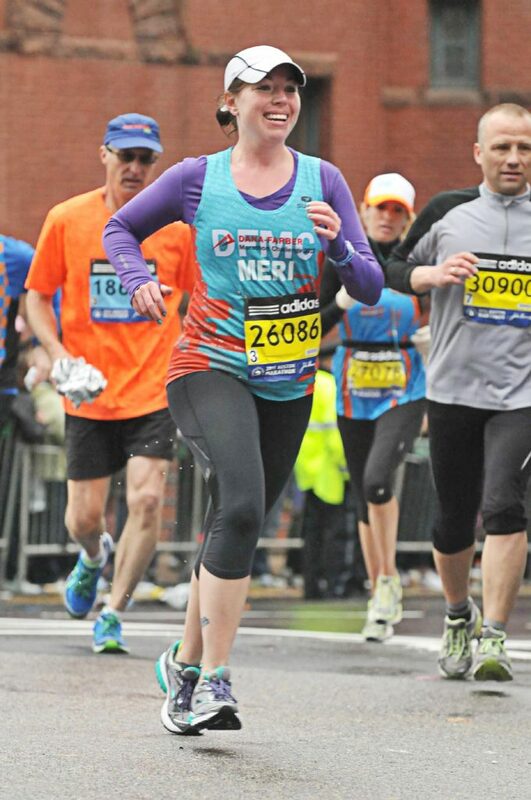 Jersey City’s Meredith Glansberg is one of approximately 500 runners who will participate in next week’s Boston Marathon while raising money for the Dana-Farber Cancer Institute in Boston. Meredith Glansberg would be the first one to admit that she wasn’t much of an athlete growing up just south of Boston. In her early 20s and residing in Manhattan, Glansberg decided she needed some form of exercise. At that point, Glansberg became an athlete – a determined and driven one at that. Through all the running, through the miles and miles of pavement pounding and physical demands, Glansberg had a huge fan and big time supporter – her father, Ken. And another thing took place through the late bloomer’s journey into road racing. Glansberg became part of the new Jersey City, the fabric of the burgeoning downtown area that is packed with young professional people. Glansberg says that she averages about 30 miles a week in her training. Glansberg pushed herself to run her first marathon in 2012 then had to take a break due to an injury. She returned to action in time to run the Miami Marathon in 2013 and then competed in the New York City Marathon later that year. In 2012, Glansberg’s inspiration, father Ken, was diagnosed with cancer (multiple myeloma to be precise). He was treated at the prestigious Dana-Farber Cancer Institute in Boston. “It’s one of the reasons why I’m so passionate about Dana-Farber,” Glansberg explained. The Dana-Farber Running Team runs to raised money for the Claudia Adams Barr Program in Innovative Basic Cancer Research at the Dana-Farber Cancer Institute. In 1990, the first Dana-Farber Marathon Challenge team consisted of only 19 runners. But this year, the roster of runners now stands at more than 500 runners. Glansberg, as well as a few other Hudson County residents, are now proud members of the Dana-Farber Marathon team that will participate in next Monday’s Boston Marathon. Every runner is asked to raise a certain amount of money for the team. Glansberg’s pledge goal this year is $12,300, to coincide with the 123rd running of the Boston Marathon. She has recently reached that goal and is now looking to surpass $13,000. Since she’s moved to Jersey City, Glansberg has become more involved in other physical activities, like weightlifting and kickboxing in a downtown Jersey City gym. And sure enough, Ken Glansberg and his wife, Myra, who Meredith calls “an incredible care giver and advocate,” will be at the finish line, cheering on their daughter. But after it’s all said and done, there’s a sense of accomplishment. Meredith and her family of 500 thank you for your support. For more information about Meredith Glansberg and the chance to donate to the Dana-Farber team, log onto http://danafarber.jimmyfund.org/goto/runmerigrun. Jim Hague can be reached via e-mail at OGSMAR@aol.com. You can also read Jim’s blog at www.jimhaguesports.blogspot.com and follow Jim on Twitter @ogsmar.